← Does Unconditional Love Have Conditions? Yes! Okay, we cannot rule the world. Someone else has that role. We don’t have power to change the world, at least not as one individual anyway. Power doesn’t run in our families where our money can shake the earth. But there are powers we have that we don’t use. It resides in the recesses of our mind. How we see life is within our own power. How we use that power determines how strong we are and whether we thrive or barely survive. It determines if we cave into the problems of life by thinking we have no choice and no options. There is a line in the movie, “Eli” (played by Denzel Washington) who was in a threatening life or death situation, and the odds were against him. He was told he had no other choice but to concede to the situation and give up the book. Eli (Denzel) said, “Oh, I always have a choice.” Very powerful statement. We always do. We can choose to take the beat downs of life and what others dish or dictate to us, or we can use our Power of Perspective to create the choices and options of what we can and want to do. Changing perspective in your relationship determines its direction. A shift of one focus or something you do or say differently can change the dynamics of your relationship and flip it to an upside position. You have that power! Work it!!! This saying is taken for granted, yet there is merit to it. Do you see “the glass half empty or half full”? Harnessing your power of perspective happens when you take on the power— and use it always. Make it a way of life. You have so many powers and gifts you fail to use, because they are clouded in your problems, to the point you become lost in yourself. Seeing things with a powerful perspective takes thought, not emotion. No. You cannot fly away on a kite of emotions and harness your power at the same time. You must stabilize and rationalize in order to harness your power and use it. When I see someone flying off the handle, I already know he/she is relinquishing their power and investing in the nothingness of emotions. Emotions are for feeling not thinking! They are not centered on power or solutions. It is said there are no jobs. Are you sure about that? Just because you hear something bad doesn’t mean it is bad for you. There are jobs being posted everyday. Yes, everyday. Can’t find the job that fits your skill set? Change it. Revise it and add other skills to your realm of expertise. Don’t want to work for a company? Work for yourself! What can you do that can make money for you? Write down some options and write down ideas of what would work to make those options happen! Staying in one place is where we remain in a comfort zone. It is time out for comfort. It is time to make things happen! Can’t do it? That is bull and you know it! 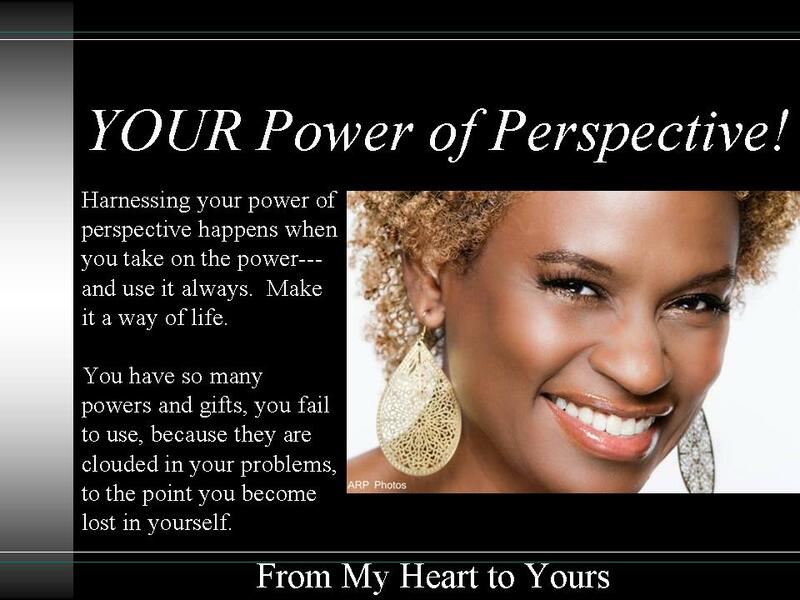 Power of perspective does not denounce reality, it only makes small adjustments to it. Information is regulated, and delivered on the perspective of the person delivering the information. All statistics are not correct. Sometimes there are important demographics not included in order to support the message. When we hear information, we don’t just accept without giving it some thought, research and reason. We must check out the validity and yes, the reality of that information. Katt Williams is awesome! In one of his performances he said, “Come on white people, and get on the bus with us. We have always been in a recession, but we just didn’t have a name for it. Come on and join us!” We have always found a way, and made a way— together! Your power is activated by thinking about the possibilities. Your power is activated in knowing you don’t have to take most of the blows life is giving you. What are your choices? There is always one. Can’t think of one? You aren’t thinking enough. Take the question to bed. It may come in your dreams. Take it with you in the car you may see a sign on a license plate, bill board, or hear the answer in a still small voice. Always think of options. There is power in creating them. I called a dear friend to see how he was doing. He said “I don’t know. I am just doing.” I gave him my power of perspective on that. “That is so much better than dead,” I said. He could not refute that. In truth, there is much worse, in “…just doing.” Then I asked him what was happening to make him feel that way. Challenge your brain to think of answers to problems. Then it will be programmed to do it naturally. What would you do to end world hunger? What would you do, one step at a time, to end homelessness? Think about it. Solutions lie right within you! How can you generate an additional $200 a month, from an entrepreneurial angle to your monthly income? The secret to more power, is not to destroy others for it, but to give some away. It will always rejuvenate to generate more power. Knowledge and a different perspective in life and about life, is power within itself. This entry was posted in Series from the Author-My Heart to Yours and tagged change your life by changing your perspective, change your relationship by changing your focus and perspective, Katt Williams, so much better than dead, your power to live, your power to the answers in your life. Bookmark the permalink. Ahhh, I get it, and I do the same as well with my life and its situations. Ex. I’m a contractor, during my times of unemployment, some would see it as a bad thing, while I see it as a vacation and learning period. I go it. Precisely my Man! Do you know how many people cannot see a flip side of good and opportunity in a situation? When I was laid off in 2010, I went back to school, maintaining a GPA of 3.85. And I studied more history, and did consulting, and learned to manage a book store in Chicago, which I did on a voluntary basis. I was laid off for 8 months, and enjoyed that part of my life. Way to go my Friend! I love hearing from you!